So I was going through my dwindling collection of beers the other day, and was reminded that I had some Green Flash brews that I haven’t tried yet. I remember when I last posted about Green Flash I had drank their West Coast IPA and it was a really easy drinking IPA that went well on a warm afternoon. I asked in that post which of the others I had should I drink next, and it was a unanimous that I try the Double Stout. I’m actually glad I waited a bit to try this because it has some great SUMMERTIME qualities that were a complete surprise, and completely welcome. As you can see this brew poured inky black with a huge mocha colored head. The nose is where this brew began to tell me it wasn’t an ordinary stout. There were the typical roasted malts, chocolate, and a touch of roasted marshmallow on the nose, but there was something more, something that seemed a bit out of place…what is that, lemon? It was there and unmistakable, lemon on the nose. This intrigued me greatly. When I took a sip, sure enough there was a lemony flavor in there right around mid palate. It was a good stout in every other way, roasty, chocolaty, with a nice coco finish, but that middle was… well weird. But in a good way, not weird bad. The unexpected lemony flavor that this stout had was the perfect accompaniment for a warm summer evening. It gave this brew a refreshing quality that often isn’t used when describing a stout. I know it might even sound a little gross or off putting, but this lemon flavor right in the middle of things really works for this beer. I’ve been wanting a summertime dark beer to sweep me away to happy land, and this one did just that. I’ve tried many different Black IPAs and there are some real good ones to be sure, but this was a stout all the way, with just a bit of summertime infused in the beer. If you have access to Green Flash get some of this and have it on a hot day. It sounds weird, but I have finally found a great and “refreshing” summertime stout. Now I just have to wait for them to officially make it to Idaho. Once they do, this will be a regular pour for me. ← If America Had an Official Toast, What Would it Be? Dieu de Ciel’s Morel Beer, stout made with morel mushrooms, I think it is called Umami, is also a lighter interesting summer beer. As is Dark Horse Tres Blueberry. Unfortunately Kenny, I hate YooHoo, and ended up not really liking Young’s either. As far as Blueberry Stout’s go I think that Buffalo Bill’s Blueberry oatmeal stout is the gold standard. Not really refreshing or particularly summery, but just yummy. And I’m sorry, here is your strike three, mushroom beer just sounds gross. I know Dieu de Ciel is a good brewery, so I might give them the benefit of the doubt, but I’m calling you out on its appropriateness for summer. Give this one a try and let me know what you think. Nice post. I agree completely. I’ve always been a fan of Green Flash but initially hesitated before buying Double Stout when I first saw it out here. Green Flash is synonymous with IPAs, hops and California Dreaming – not rich and contemplative stouts (though AleSmith would certainly take issue with that). Anyway, I loved Double Stout the first time I poured it and felt the same way every time after that. Whether its a little bit of Summer or a little bit of San Diego, it works. Of course its always summer in San Diego, so it works completely. I had one back when they were available hear. Liked it quite a bit. I’m not sure if I ever pegged the lemon quality. But don’t deny it’s there. Just recall it being more of a dry stout. And yeah, super easy to drink for a stout. I don have another bottle in the fridge I believe. I should track it down one of these warm evenings. 🙂 Mad River Brewing makes a dry stout, that I like for warm weather drinking, too. Brewforia generally has it. Yeah, the Mad River Stout is good anytime, and at their price point you could choose to drink stout exclusively if you were so inclined. Try it again and look for the lemon about mid palate. Once you detect it, you will never be able to not tell its there again. BTW: as I mentioned, I intended to drop into Blue Mountain Brewery while I was attending the genealogy workshop. We managed to get away Saturday evening. When we got there the place was so crowded that they had people directing parking and a waiting list. Fortunately for us, we only waited about 15 minutes. While waiting, I tried their Rockfish Wheat–“an authentic Bavarian-style “Kristall Weizen” filtered wheat beer”. I didn’t particularly like it but then I’m really picky about wheat beers which I first learned to like in Frankfurt, Germany. Once we were seated I opted for their Dark Hollow Artisan Ale. I can’t say enough–you’d love this beer! Because its 10% abv, it came in a half. One sip and I was hooked. It was music in my mouth, as if Maker’s Mark had decided to switch to beer. A deep black brew, its aged in Maker’s Mark barrels. This is a true sippin’ whiskey, er, I mean beer. The backbone is pure Maker’s Mark Kentucky Whiskey. Smooth on the palate, its heaven in a glass for anyone who likes both beer and whiskey. You have got to give this one a try! I ended up bringing home two bombers of that and another of their Steel Wheels ESB, which I opened last night–another winner–arguably the closest thing to a good British real ale I’ve tasted in many a year. Both are bottle-conditioned, so I’m saving my two bottles of Dark Hollows–one to share w/ my son-in-law when he has some free time and the other to share w/ my wife’s cousin (a mean home brewer) at Xmas when he comes up from Alabama. 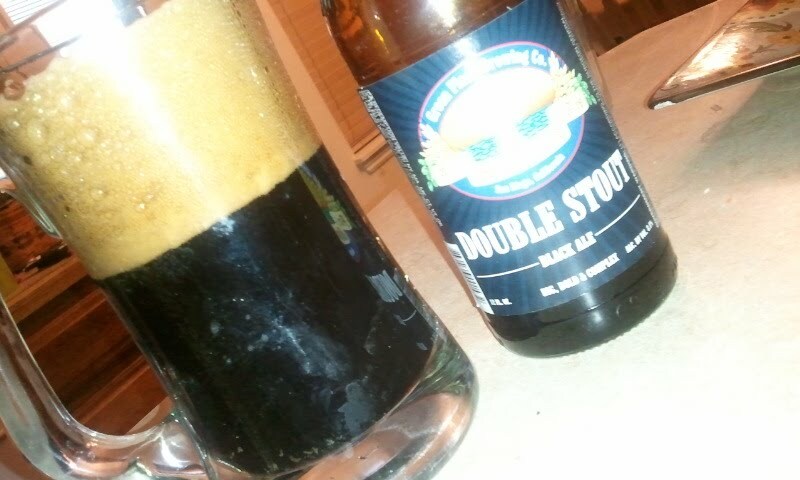 Totally with you on the Double Stout (was I one of the people that recommended it? I think so but am not sure)! This, much like all of the other Green Flash beers I’ve had so far, is excellent. Not sure about the lemony bit though. Will have to revisit. Great review of a great beer! Fascinating! I’ll definitely try this if I happen to stumble upon a bottle. Hmmm this is one of the few Green Flash beers I haven’t tried. Looks like I need to pick it up sometime soon here! This is a great stout, any time. While they are really known for their IPAs, Green Flash’s Belgian inspired beers are amazing. Rayon Vert is hands down, one of the best brett beers for the bucks. Think homage to Orval and you’ve got it. I don’t but I’ve heard great things about it. I do have a Le Freak that I eye every time I inspect the bunker. I’m a bit late on this one, but I just tried Flying Dog Pearl Necklace Oyster Stout (yes it contains oysters–“brewed with Rappahannock River oysters”). Its a dry light stout (texture similar to a porter), w/ a huge head. Taste and body lend themselves to the summer refreshment venue. And if you shake it vigorously before opening, the “pearl necklace” part happ…never mind…. I miss our conversations at Brewforia. This post caught my eye because I’m now living about a half mile from Green Flash (long story). Aside from their lighter offerings, I like most of what they turn out.